I'm so excited to bring you this simple and easy to make tutorial that, I can guarantee, makes a big impact! 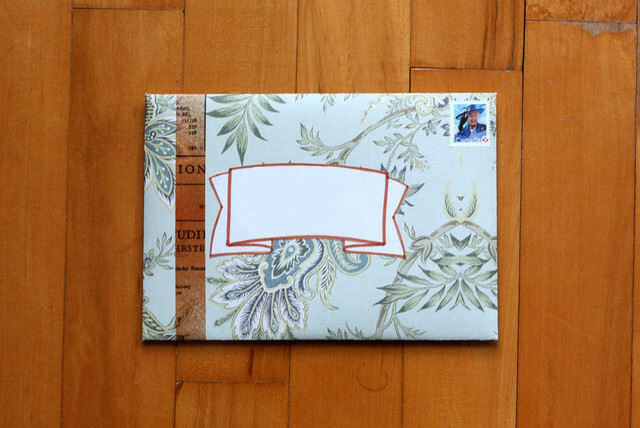 I have a ton of envelopes at home, many which are plain and generally quite boring. The good thing (ok, one good thing of about a billion) about running your own paper business, is that here's always plenty of exciting envelopes to use. So, the plain ones are often neglected. 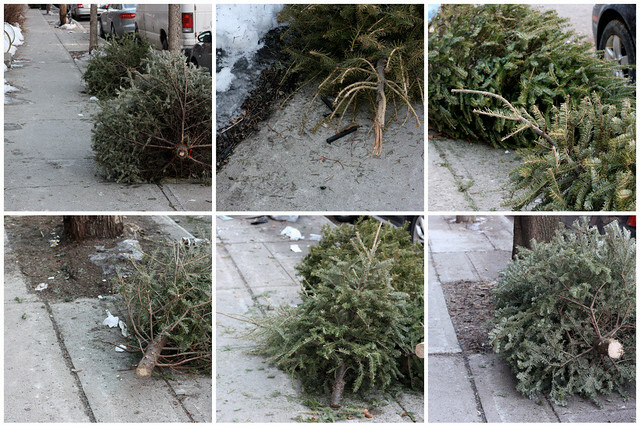 I hate waste, whether it's for perfectly good items or the space it takes to store them. This tutorial solves all these problems! 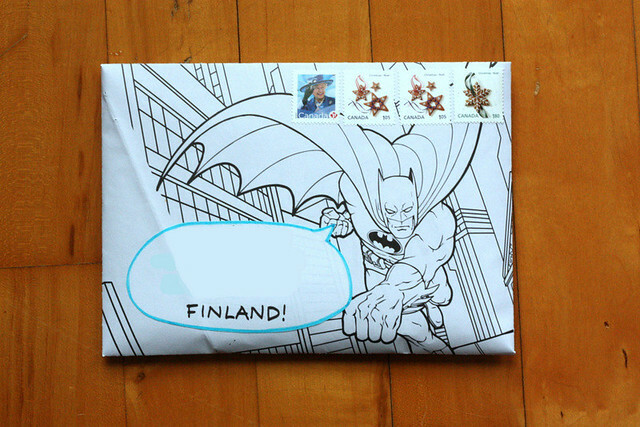 I will definitely use these envelopes. Aren't they awesome? They are modeled after super-classy, super-expensive stationery. The best part about this? Cheap, easy and fast! 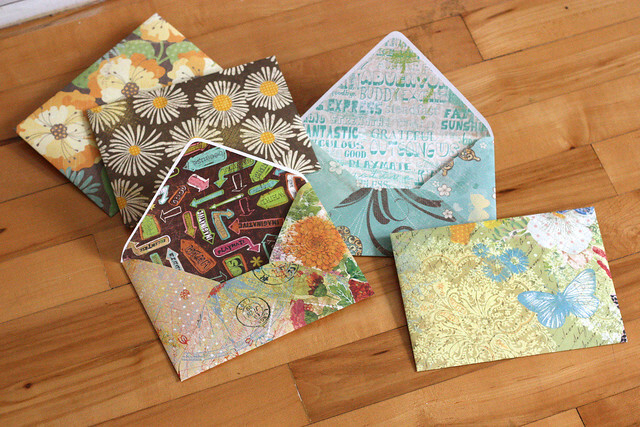 All you need to make these yourself are; envelopes (any kind will work, whatever you have lying around), washi tape and scissors. 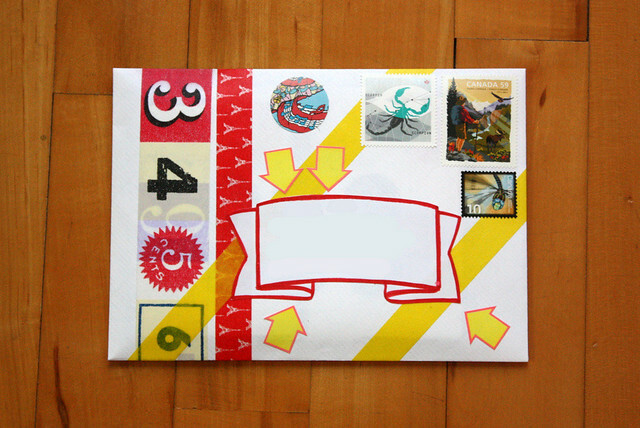 Start with the bottom of the envelope. 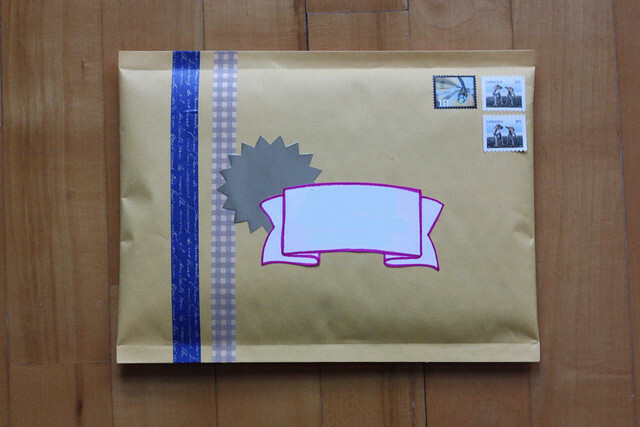 Place a strip of washi tape so that half of it is attached to the envelope and the other half overhangs. Don't worry about the excess tape at the ends. 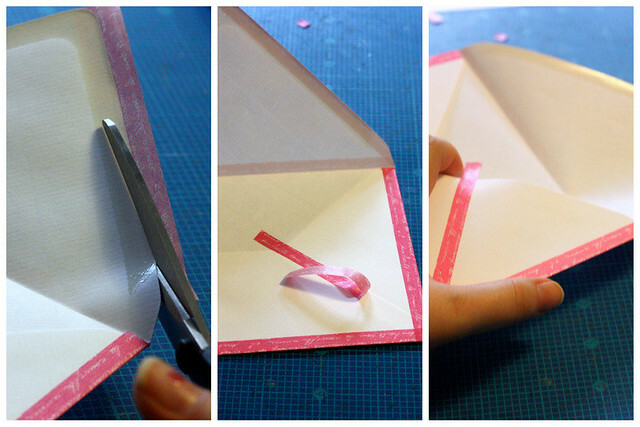 Turn the envelope over and fold the excess on the other side. 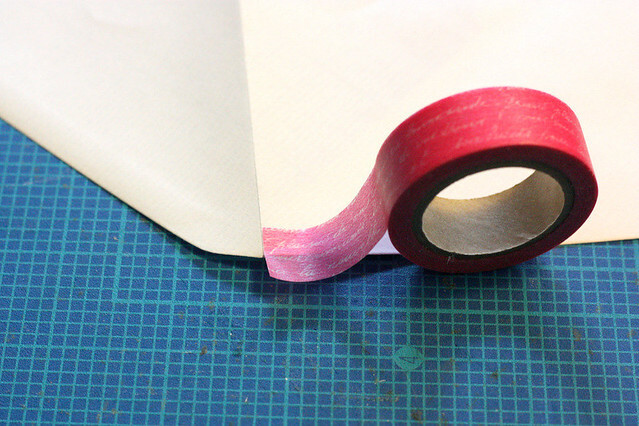 Trim the excess tape from the ends. 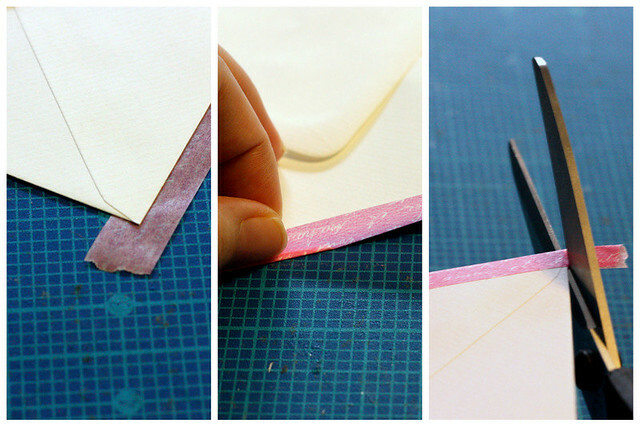 Repeat the same process on the shorter sides of the envelope. One trick I found made it easier for me, is to cut the end of the tape straight before taping the top of the short sides. 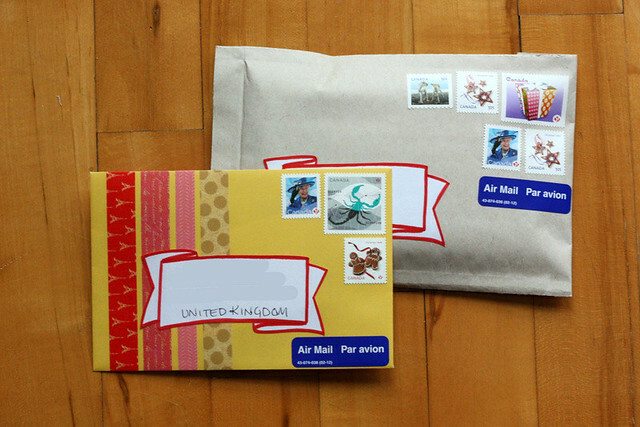 You'll get to the backside of the envelope soon, so just start from the top of the envelope for now. 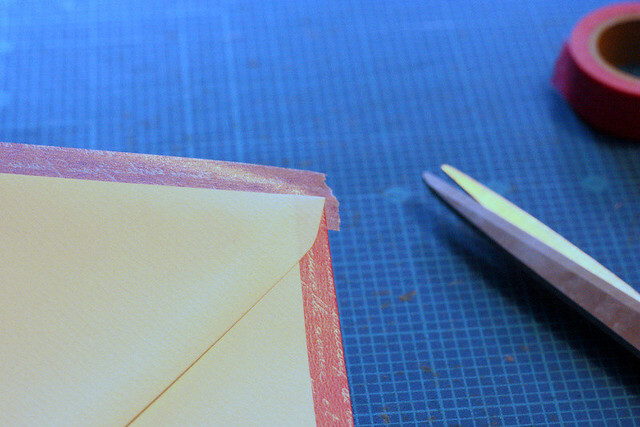 When you get to the top of the envelope, I trimmed the excess tape form the ends before folding it over. Again, I find it a bit easier that way, but it's up to you. Now you have all four sides taped and it's time to finish the back. 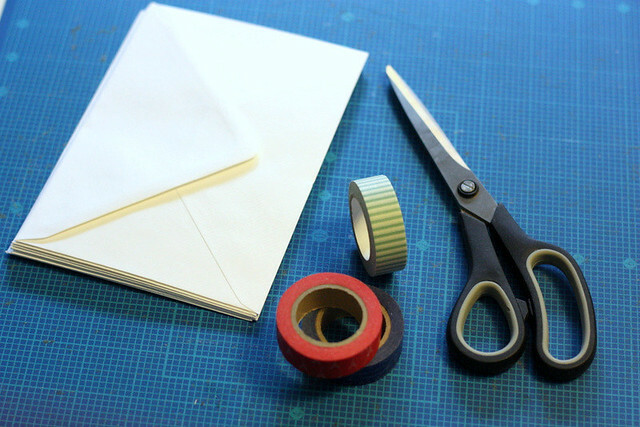 Open the flap of the envelope and start taping one side the same way you did the others. 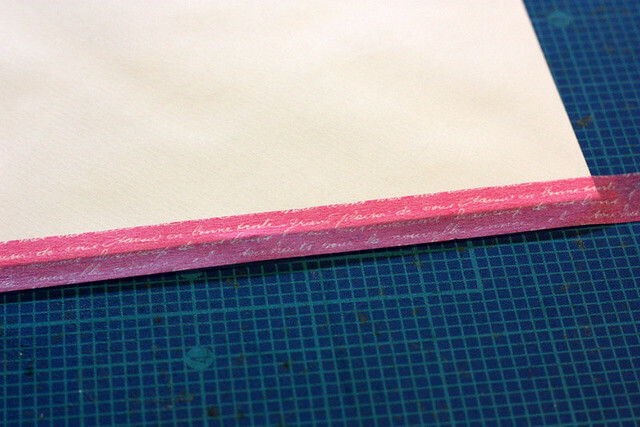 Instead of folding the tape over to the other side, cut it along the flap. If you fold it over, you'll cover the adhesive surface, and you wouldn't want that. 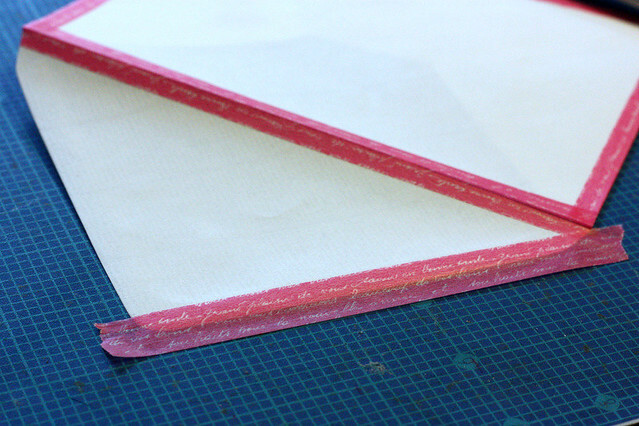 Now, take the long strip of tape you cut off from the flap and place it along the edge of the lower flap of the envelope (the one that's glued on to the sides to keep it together). 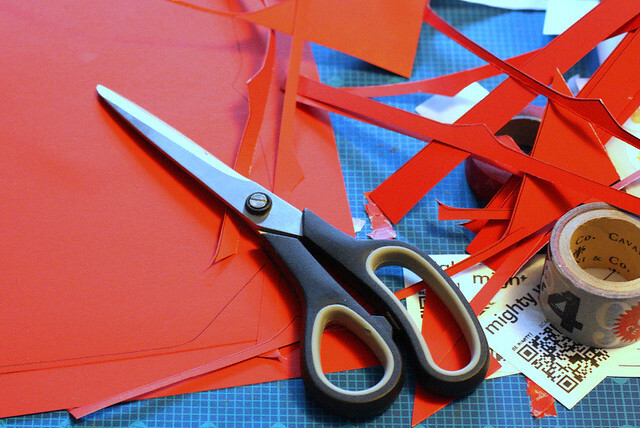 Finally, trim off the excess tape from the ends. And you're done! 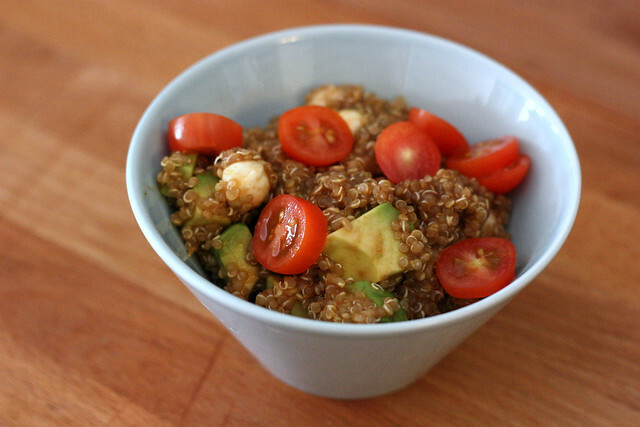 It's really simple to make and very quick. 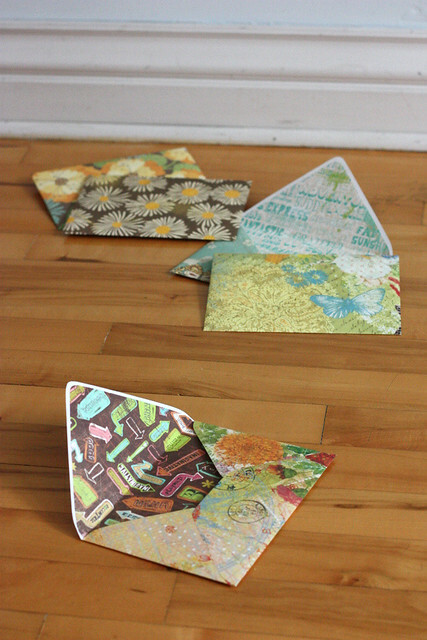 I had to try out different color combinations and will, for sure, make more. Please let me know if you're going to try this out! I would love to see what you've made! Admittedly, I have quite a few rolls of washi tape, all which I use very frequently. Recently, I was convinced I was missing a few. I kept looking, but in the end just decided I must've just used them. Well played, cat! Well played! I'm keeping the momentum going. There's still some mail I owe, but I'm almost caught up. I wanted to make sure that this one is not going to be mistaken for a bill... 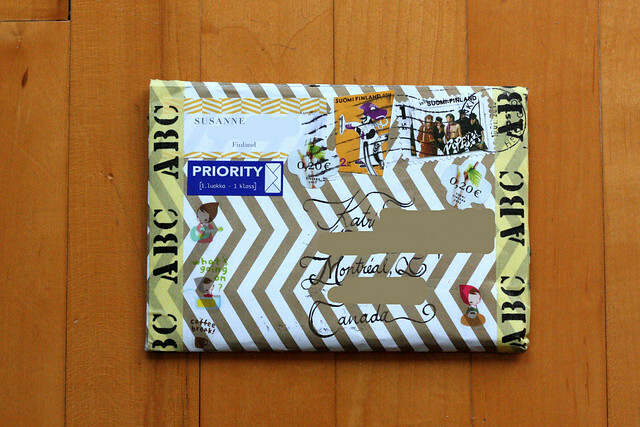 The envelope was made here and covered in all sorts of stickers. This is more muted but pretty awesome, even though I say so myself. 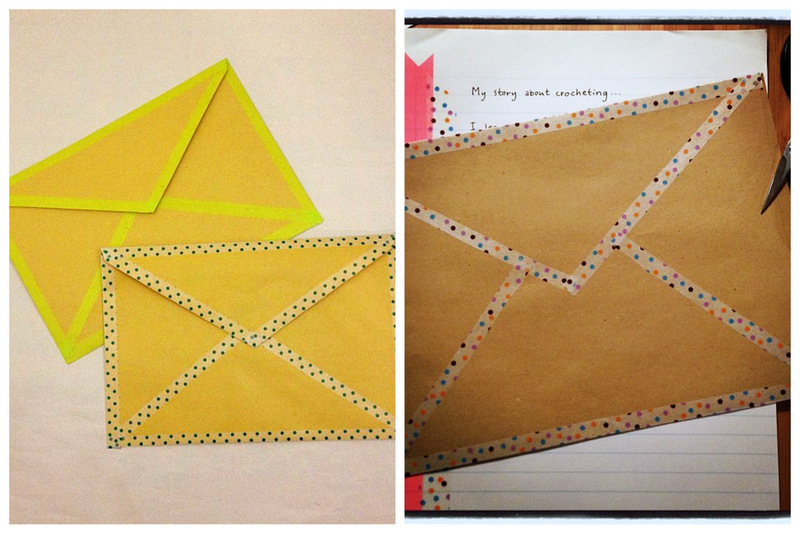 It was an accidental craft and so much fun to make that I'm writing a tutorial for you guys. It's simple and cheap and totally awesometastic. Stay tuned for the tutorial! Some more washi tape decorations. 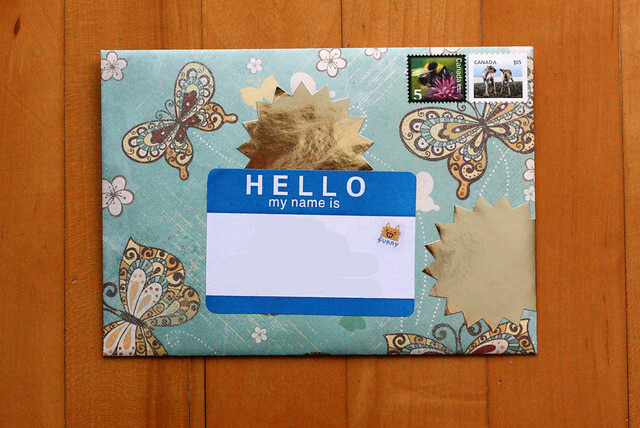 Oh, and I tried a different kind of a banner for the address label. 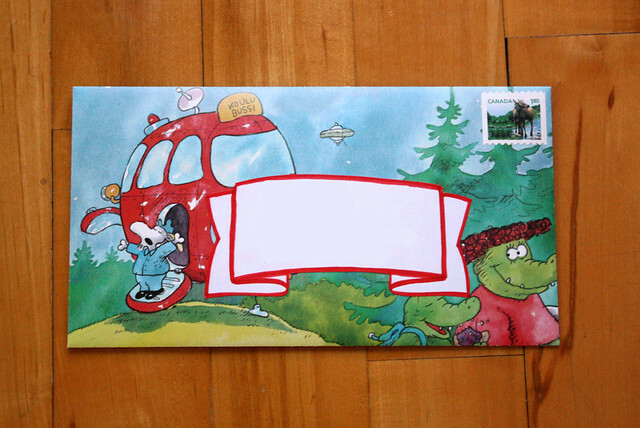 As you can see from the two previous photos, I am running low on stamps. It's just incredible at what speed I go through these and I know I don't actually send *that* much mail... I had to get more and ended up spending almost $70. Oopsie. I'll show you what $70 worth of stamps looks like once I get them. One more of the same envelopes you saw here. This is the last one. I need to make more. I got a few things this week. The one on the bottom is actually something I ordered online. The top one is a really nice collage from my friend Lynn. She definitely has this repurposing thing down! 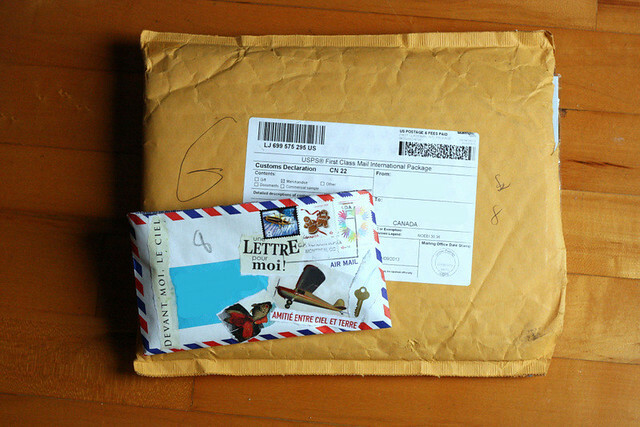 Did you get anything good in the mail? 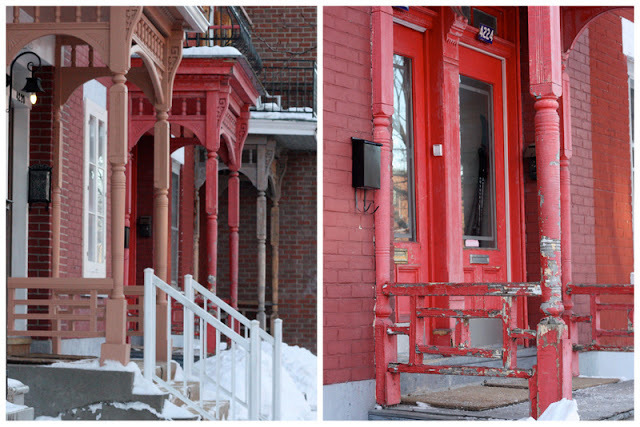 I don't keep my love for Montreal hidden, nor do I hide the fact how much I love old buildings. Sometimes I wonder if I should've listened to the 'choose a career' tests that have all, without a hitch, told me I should be an architect. Too bad I took those tests only after I had already (figuratively?) moved over to the dark side and chosen a life in business. I do love the colors that people are brave enough to use here. Admittedly, it's not the Caribbean up in this joint, but you can see the love for color when you take the time to look around. I found these beautiful reds just a few blocks from my home. 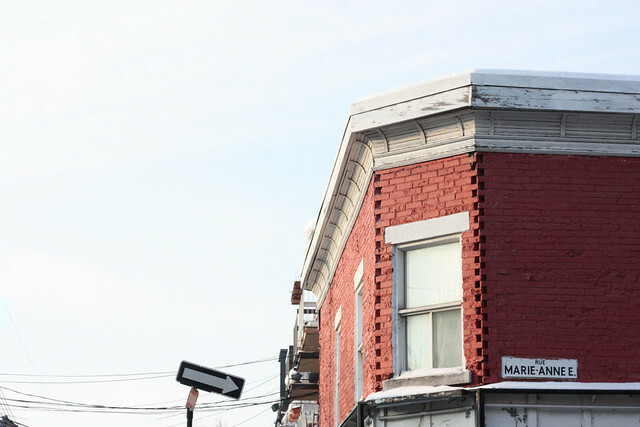 I also snapped a photo of a bright pink building. 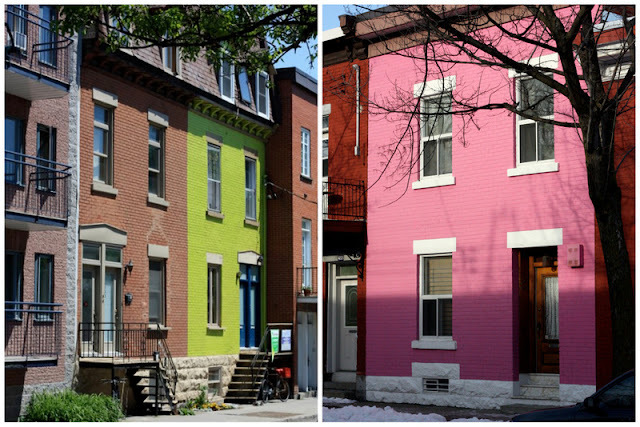 It seemed it was a match made in heaven with the lime green one I photographed last summer. I felt like they just had to be put together even though in reality they are about a ten minute walk away from each other. So, I'm looking for confessions today... Any other architecture nerds out there? Show me your hands! My love for repurposing old, unloved items has certainly become clear in the course of this blog. I mean, I did start a business on that passion. It's not just limited to paper products (as much as Chris would probably hope it did). I obviously can't get that little table out of my head. The one I mentioned just a few days ago, the one from the thrift store. I want to have older pieces of furniture in my home. I already have some and am constantly on the lookout for more. 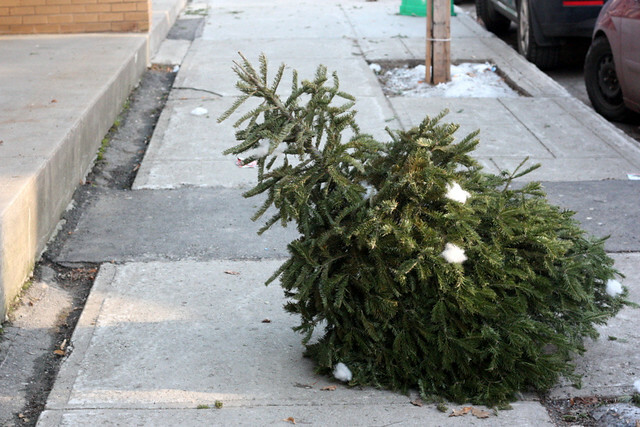 I mentioned the trunk last Friday. I love the idea of combining old and new together. I already do a lot of that in the way I dress. I want to bring that even more into my home. I dream of the day I'll find that perfect piece of furniture. I'm not quite sure what that would be yet, but I'm convinced I'll recognize it when I see it. Do you have an awesome old piece of furniture? I would love to hear about it! Today is cold. 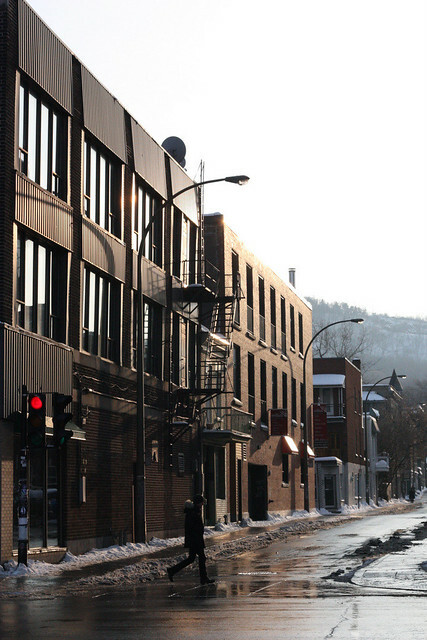 Being born and raised in the north -5 Celsius is not cold, even if you're not a wintery kind of a person. The -26 Celsius we have today, however, could constitute as a 'tad nippy'. Just kidding, it's freezing cold out and I am not going to voluntarily go outside unless I absolutely have to. Good news is, I have a ton of stuff to do today and luckily (or at least so far) seem to have everything I need to do those said things. I ran a ton of errands yesterday, which I deemed a stupid idea when I was outside with -21 degrees, but in hindsight might not have been such a bad idea after all. The only thing though was that I wanted to go back to a thrift store I was in yesterday. I wasn't sleeping well last night, so while I was tossing and turning in bed, I came up with a brilliant idea for a small table I saw at the shop yesterday. I am tempted to go back, but haven't convinced myself yet. We'll see. Despite the ridiculously cold weather outside, it's absolutely beautiful. 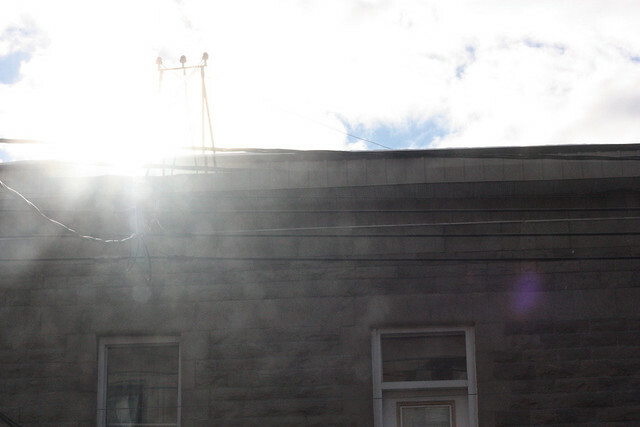 The sun is shining full force and the light is stunning. Which means I need to take as many photos as possible. 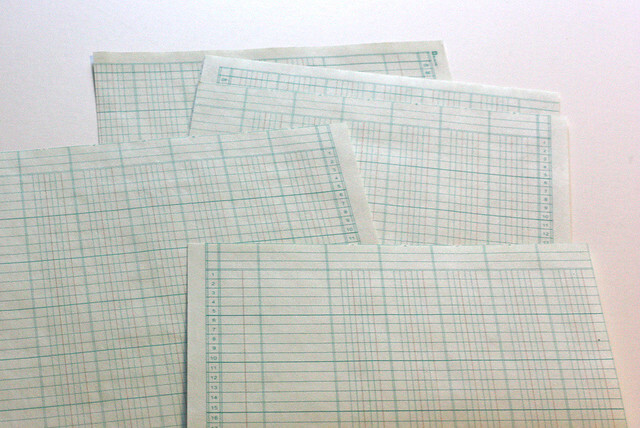 And I have some other projects I'm trying out too, currently involving vintage ledger paper. Again, I'll post tutorials as I get things tried and tested. 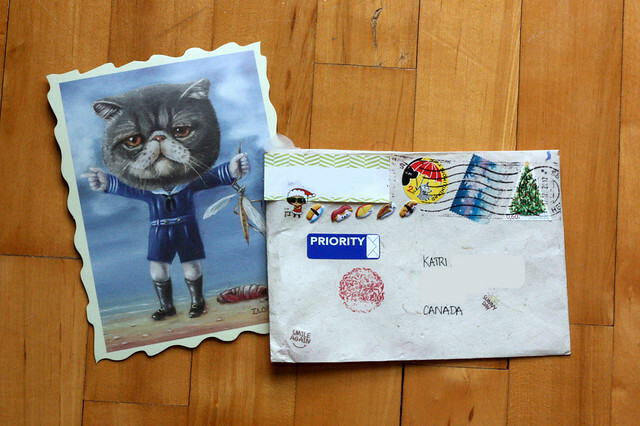 I'm happy to report that I have been able to send out a few more pieces of mail. It's slow going still, but slowly and surely I'm catching up. There's more to talk about, but that will have to wait a little while longer. I rediscovered these sunburst stickers. How could you not love some extra gold on your mail?! The packages going out this week also got the gold. Both of the are actually from Susanne! 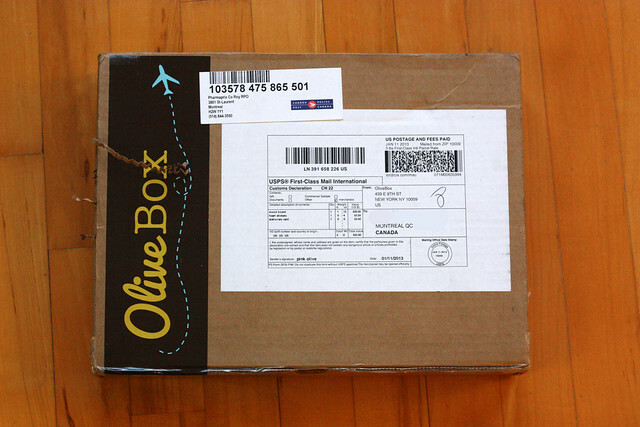 The first is a letter (with some chocolate) and the other via OliveBox. She got a subscription for me for Christmas. More on that a little later too... Thank you Susanne!!! A new coffee table has been on the shopping list for a long, long time... There's nothing really wrong with the current one we have, it's just been around for a long time. Now, I do believe in investing in furniture that's going to be around for a long time and I don't want to toss something simply because it's outdated. 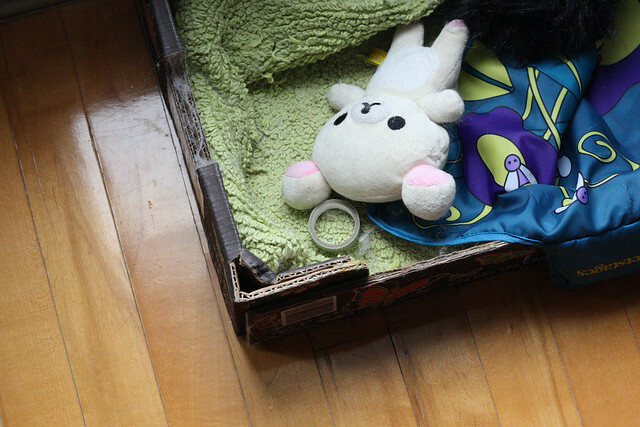 In the case of our current coffee table, it's close to the end of it's journey. It's actually a table Chris bought very cheaply from Ikea when he first moved out on his own about a decade ago. We've already switched the legs, painted it and re-covered it. I'll show you photos another time, but needless to say it has suffered through the moves and I doubt it can be salvaged from this. So, we have been talking about replacing it for a while. A few years already. I have a good idea what I want, but we've yet to find one we both like, at least in a reasonable price point. It's been really, really slow with mail recently. Totally my fault though. I owe letters and other mailed goodness to more than a few people, so I can't really expect anything coming this way either. I'm still working on all the changes I keep mentioning. At least I'm making some definite progress, so you should see something more concrete soon. 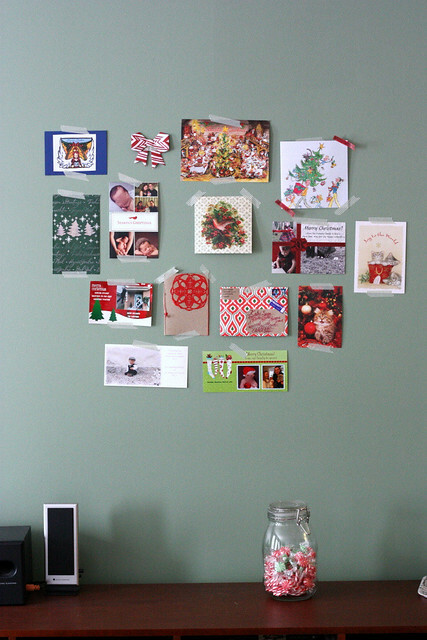 Until then, however, I've at least started catching up on my mail. 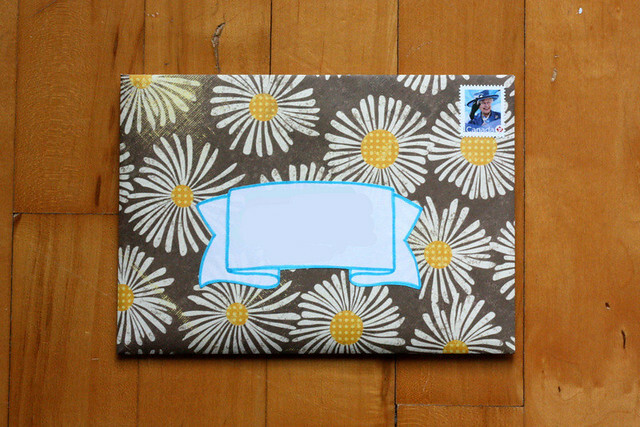 I sent out this flowery guy over the weekend and there will me more to follow soon. 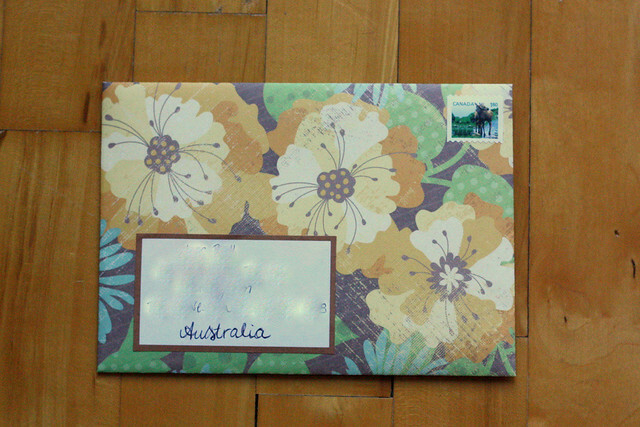 I really like the colors of this one, it's the first envelope I'm sending out of the ones I just recently made. I feel like my head's been somewhere else all week. I have a lot to write about, but every time I start, I end up deleting what I wrote. A large part of this week has been used up by thinking. 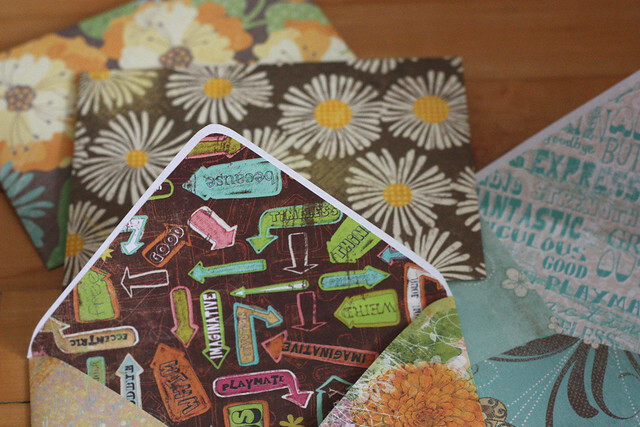 I've been making plans for 2013 for my shops and working on some of the things I planned already. I've started designing my new business cards, I have updates planned for the blog as well, I am testing out new products and generally working on renewing practically everything. I've known for a while that change is needed, but it's making the initial decisions that take up so long. I know that once I've figured the major changes out, the rest will fall into place. 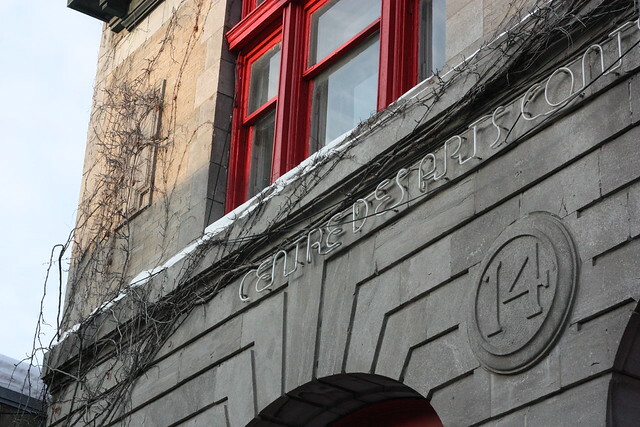 More often than not, this Friday Inspiration post is about design, repurposing or clever projects. However, there are other things that inspire me as well. I've recently talked about some new ideas I have for my blog and I guess because my mind is in a state ready for changes (not just for the blog) there's a few posts I've stumbled upon recently that hit home. The first one is from Julie. She wrote her story as a small business owner. I enjoyed reading it and tremendously admired her openness. Another thought provoking post, and one that I really read at an extremely appropriate time is "Adapt, Quit or Evolve" from A Beautiful Mess. It really sums up challenges I also am facing right now. Have you read anything recently that really resonated with you? Care to share? I had some errands to run yesterday and since the weather was pleasant, I took my camera with me again. It's been a while since I've done that. Just as before, I try to always keep an eye out when walking around. 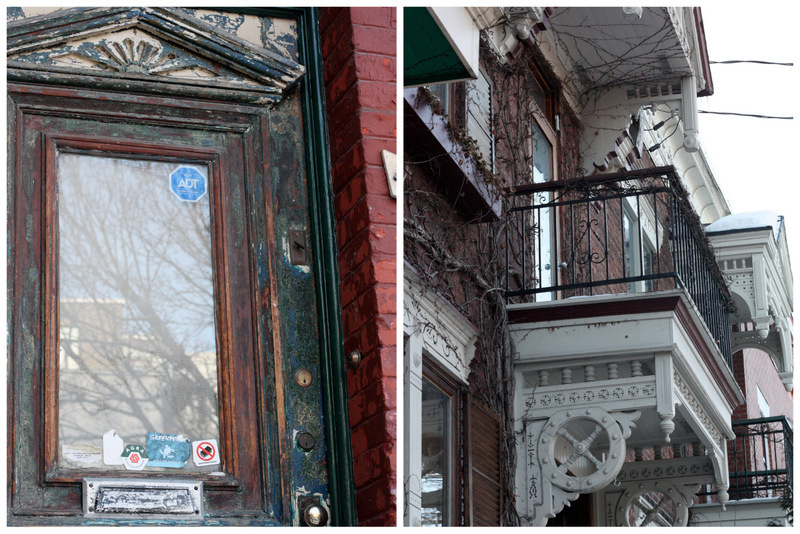 I find it help add even more to the charm of the area you live in. I figure there's always something interesting to see if you take the time. 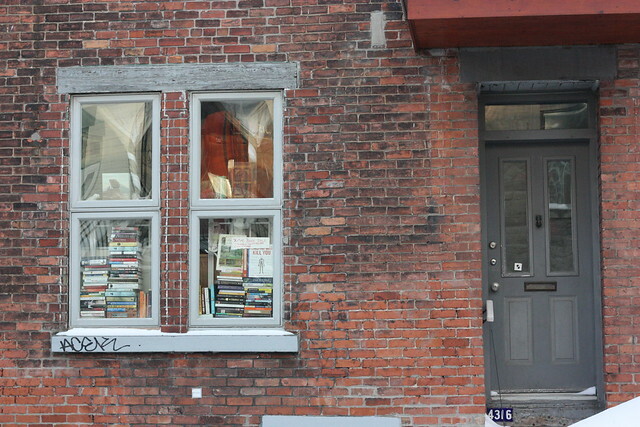 Sometimes it's just little details and other times it's windows covered in books. I wanted to go closer to see the books, but it seemed to be someone's home. I figured I'll just take a photo and move on.